Ask anyone what’s on their bucket list and the majority of people will have no difficulty rattling off at least five things they want to experience before they die. Ask me what’s on my bucket list and the only difficulty I will have is naming something that doesn’t have to do with Disney…well at least naming more things that don’t have to do with Disney. With that being said, this may be the first in an ongoing series where I cover things that are on my WDW bucket list and hopefully one day I will be able to review each item on my bucket list after experiencing them for myself. The reason I have been slacking a little lately on the blog is because I have been pursuing one of my bucket list items. The one I have been tackling lately could be found on my non-Disney bucket list but consequently will allow me to experience one of my WDW bucket list items. After spending two weekends in a classroom and pool, followed by one weekend in a quarry, I am now scuba certified! I have always loved the water and have wanted to scuba dive for as long as I can remember. Now that I am certified, of all the places there are to scuba dive, the only one that is a “must do” for me at this point is the 5.7-million-gallon saltwater tank in Epcot. You might be asking, “How do you plan on doing that? Are you planning on working there someday?” Well, as a matter of fact, I do plan on working there someday but I don’t have to be a Cast Member to dive the waters of the Living Seas. DiveQuest offers scuba certified guests the opportunity to experience the Living Seas from the other side of the 6 inch “glass” (actually acrylic). This unique experience cost $175 and 3 hours out of your day but in my opinion, would absolutely be worth it! I have had my share of being “on stage” at WDW and all of those instances have been free but I would have easily paid for the opportunities I have had to experience WDW in a way most do not get to. I will not hesitate to shell out (see what I did there?….”shell” out!) $175 for this experience! As a DiveQuest participant, you become part of the show for those admiring the 6,000 creatures who call the second largest saltwater aquarium in the world their home. Guests dining in the Coral Reef Restaurant will watch you with envy and you may watch them with envy as you swim right up to their table an observe their appetizing entree. Guests wandering the Living Seas pavilion can also view the show through any one of the 56 windows measuring 8 ft by 24 ft, weighing in at about 9,000 lbs each. For a WDW nerd like myself, it’s like Christmas morning anytime I can get a look at the behind-the-scenes at Walt Disney World! I am just so intrigued at how Disney does the things they do. DiveQuest, of course, offers participants a back-stage look at the Living Seas Pavilion and what it takes to run such an elaborate man-made environment that supports over 60 different aquatic species. I have read numerous accounts of guests who have experienced DiveQuest and they all have mentioned that the Cast Members instruct participants that when they enter the water they are now “on stage” and to act accordingly. 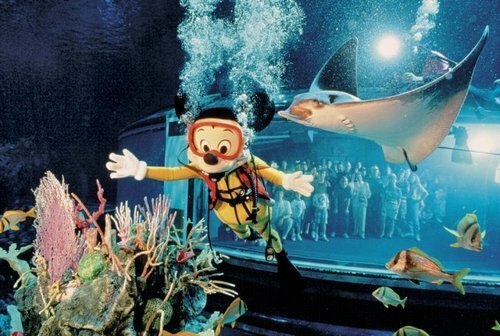 As entertaining as it is for those diving in Disney’s aquarium, they have also volunteered to be part of the show and have now become part of the entertainment for everyone else. How many times have you been enjoying a nice sea food dinner and a scuba diver swims right up to your table? That would make for and interesting meal right?… Remember that Disney is all about the show. When Disney allows guests to be part of the show they want to be sure that those not participating are also entertained. I think it would be even more of a magical experience for me if I have someone else there to experience it with me, not necessarily in the water but on the other side of the glass. I think it would be cool to swim up to the glass and to see my family on the other side. We have a family vacation to the World in the works for next summer. As of now it is going to be my mom and dad, my sister and brother-in-law, and my niece and nephew. I think it will be a unique experience for them to them as well. This entry was posted in EPCOT, Hidden Treasure, WDW Bucket List and tagged aquarium, bucket list, cast member, Living Seas, saltwater tank, scuba diving, travel, vacation, Walt Disney World. Bookmark the permalink. After I originally commented I clicked the -Notify me when new comments are added- checkbox and now every time a comment is added I get 4 emails with the identical comment. Is there any manner you may remove me from that service? Thanks! There should be an option to unsubscribe or change your subscription settings at the bottom of the email. I am sorry that it is doing that! Not sure why.